Having recently dipped my toe into the world of Doctor Who with The Face of Evil and The Robots of Death , I determined that it was time to delve into the exploits of earlier Doctors. As such, my next choice was Story No. 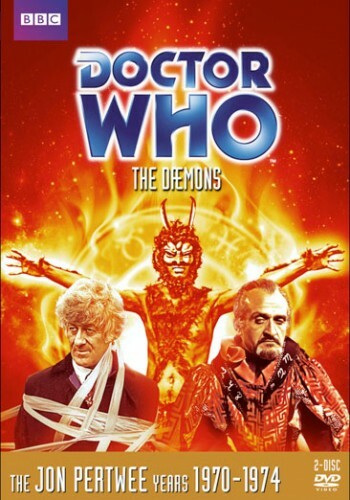 59, The Dæmons, featuring Jon Pertwee, the Doctor from 1970-1974. It certainly didn't hurt that this also happened to be the only Doctor Who DVD assigned to me, prohibiting any actual choice in the matter. Nevertheless, my lot had been cast and the hands of fate had determined that I would follow The Doctor, his companion Jo, and a gaggle of officers and soldiers from UNIT into the peaceful village of Devil's End, where strange things were afoot. Seriously, with a name like Devil's End, it's probably safe to assume that strange things will be afoot, isn't it? There's a local tavern known as The Cloven Hoof and the neighboring town is called Satanhall. It's only a matter of time before something wicked this way comes and in this particular instance, something wicked takes the form of The Master, who seeks to unlock an ancient power for his own evil ends. But I'm getting ahead of myself. The story opens with an old man dying after encountering something in a graveyard. A local doctor says it was a heart attack but the local crazy cat lady knows better; he died of fright. This piece of information has been made available to her through the casting of runes. You see, this woman is a witch, and she is quite certain that evil is in the air. Devil's End has a long history of superstition and pagan rituals and with an archaeological dig taking place at the Devil's Hump (a nearby bronze age burial ground), something bad is almost guaranteed to happen. Meanwhile, The Doctor and Jo are watching the BBC coverage at UNIT headquarters. They debate science vs. magic, with Jo allowing for the possibility of the unexplained and arcane and the Doctor coming down firmly on the side of science. Nevertheless, he is convinced that the crazy old lady on the news is correct - something's going down in Devil's End. That something is The Master, who has disguised himself as the local vicar and found himself a local coven. They start taking part in some pseudo-Satanic rituals, complete with (presumably intentional) misquotes of Aleister Crowley, black candles, and some seriously amazing ceremonial robes. Next thing you know, there's a little dude in a gargoyle costume running around wreaking havoc and a 30-foot tall satyr traipsing around the countryside. And that's like, maybe the first two out of five episodes. Now, what I really dug about this series is that in (what I'm coming to find is) typical Doctor Who fashion, all is not as it seems and there's usually some sort of metaphor involved. In this case, it turns out that the dæmons are actually an ancient race of aliens responsible for giving technology (whether it be the gift of fire or the spark of the Industrial Revolution) to humankind. What the people of Devil's End know as magical tradition is really just leftover science experiments from another world. I'm a huge sucker for these kinds of twists, as well as a fan of the Devil, so - hey, double whammy for me, right? This being my first exposure to any Doctor outside of Tom Baker, I found myself intrigued and quite entertained by Jon Pertwee. His doctor is much more stuffy and aristocratic, with pursed lips, a frilly silk shirt, and fancy velvet jacket, but I found him to have a unique sense of humor which made the character come alive. If I had to compare his humor to food (and why wouldn't I? ), the first thing that comes to mind would be a Saltine cracker. Dry, dry, dry. There was something about him that reminded me of Stewie from Family Guy. Maybe that was just his voice? At any rate, I liked Pertwee's version of the Doctor quite a bit and as with the Tom Baker era, I will definitely be back for more. I also enjoyed the supporting characters and while the fact that the Doctor was working with an UN-sanctioned team seemed a little odd at first, I certainly can't complain. The story was as cerebral as it was action-packed, so there was a little bit of something for everyone. Especially if you like things that are British - almost stereotypically British. Underbites, harrumph-ing at ludicrous ideas - that sort of thing. Me? I love that kind of stuff, so I can't get enough. This two-disc set also includes a variety of special features including another in-depth behind-the-scenes look at the creation of the show which I've discovered are a trademark of these releases. As a novice in the world of Doctor Who, I find them immensely informative and entertaining. I have to imagine that a diehard fan would go nuts. There's also a bit of a tribute to one of the show's writers and what appears to be home video footage shot during production - another nice peek behind the curtain. Once again, I find myself utterly overwhelmed by my love for this series. It's one of those things that seems so tailor-made for my tastes that I'm both embarrassed and surprised that it's taken me so long to discover it. To call the writing clever would be an understatement and in most cases, the same goes for the performances (though to be fair, there's a certain level of kitsch to these old episodes that's very charming). The only drawback I can think of for potential viewers would be the unfortunately miniscule budget the series had to work with. They do amazing things with what they've got, but it was something that turned me off the series for years. I'll be the first to say that it doesn't take long to get over it and in all honesty, sometimes that small budget creates an absolutely terrifying atmosphere. And if you're an old-school Doctor Who fan, I'm not telling you anything you don't know. If you've never been exposed to the series or you are only familiar with the new episodes, I highly recommend you check these ones out. The Dæmons certainly isn't a bad place to start.